Also known as the Fraser Island Creeper, Tecomanth Hillii with its brilliant pink to red flowers is one of the more spectacular native climbing plants. The flower hang in large umbells, each around 8cm in length. The vine itself if woody and the foliage are a deep glossy green. In the natural environment flowering is in the winter months. Tecomanthe are a fairly fast growing subtropical forest climbing plants with large flowers. The most widely grown species is Tecomanthe ‘Roaring Meg’ sometimes commonly referred to as ‘Fraser Island Climber’. Tecomanthe hillii, ‘Fraser Island Creeper’ or Tecomanthe ‘Roaring Meg’ is a very attractive pink creeper or climber from Fraser Island and nearby areas in Queensland. A few named cultivars are also available including Tecomanthe Island Belle which is a T.hillii type. Although these are a tropical to sub tropical plant they can be grown in cooler climates provided that an appropriate warm and protected micro climate is maintained. In cooler areas growth habit will be slower which can be an advantage if you are considering growing in containers. Best grown in a moist soil in a position where the root system is kept cool and the vine is allowed to climb and scramble through taller trees and shrubs. T. dendrophila is the ‘New Guinea Trumpet Vine’, best suited to true tropical climates. 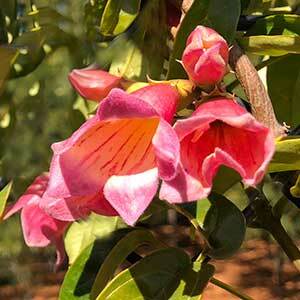 T. montana is also from New Guinea (pink flowers with yellow centres). T. speciosa or the ‘Three Kings Vine’ is from New Zealand and has large white – yellow trumpet shaped flowers, rare and endangered, and not offered for sale in Australia.